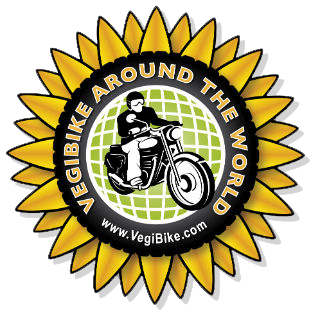 VegiBike, veg oil and diesel fueled engine, classic Royal Enfield motorbike by Harry Lyon-Smith: 17th/18th June, Brindisi, Italy. Found a first class campsite, that was more of a holiday resort. Friendly staff, particularly Maria in reception who spoke excellent English. A very well run place that was clean and had a pizzeria by the pool. Saved troubling the Colman stove etc. Slept like a log till this incredible racket at 3am woke me. Thinking that this huge engined thing was going to run me over, I got out to see that it was a tractor with a spray machine, dowsing the numerous hedges with insecticide. I found out that it had to be then as that is when the mozzys settle. It was a short run into the town and found a ferry booking agent almost immediately, I had allowed an hour for this, so this put me ahead of the day. Alas no cabins left, so an airline time seat was the next best thing. With 6 hrs to fill, I parked Batty by the train station and wondered into the centre/port. Great town that has many echoes of the Romans. In the museum it tells how it use to be their eastern Mediterranean port that many a campaign launched from. Next to the museum was the cathedral and there was a wedding taking place, so did not venture in. The side door looked right into the service and this beautiful bride in the loveliest of dresses was kneeling taking her vows next to this thug of a man... Mafia I thought, rather ungenerously. After lunch found Internet cafe right by where I had left Batty and caught up a bit. Yesterday and today have been the hottest day of the trip so far, 31 degrees I saw on a sign. When on the move, it is fine, but wearing all the armor etc when one pulls up, it is a sweaty business. 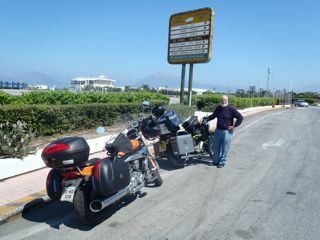 At the docks have had the pleasure of meeting Paddy, a 70+ year old retired architect biker from Waterford in Ireland. He is on a 6ish week tour of Europe. He is having a great time, largely staying in youth hostels. It is his 45 wedding anniversary tonight, and poor chap has had me across the table as his wife is minding the fort back home. Also on the boat, who we met queuing for the boat, about 20 Vespa owners from Sicily making their annual tour. Great guys of all ages, who love their bikes and a fun time. They were mighty perplexed by Batty, but she won them over quickly enough. Bye bye Italy, I have loved nearly a thousand miles of your roads, your fabulous hill top villages and towns, rich history and architecture ( what little i saw). Alas I did not found you the friendliest bunch, although the exceptions were lovely, I guess had I spoken your language it would have been a different story. I was a surprised that the Pizza is your national dish, far more pizzerias than UK tandouris, let alone pubs, they were on every corner and in the tiniest of village. Good to see you have arrived in another port and country. Problems with clutch? And electric all fine ?